Enjoy the top 1 famous quotes, sayings and quotations by Geetansha Sood. “She was this girl living in a bottomless hole of her thoughts. One day she saw a light. She felt the warmth and walked in its direction. It was there that she found him. He spoke to her and wove tendrils of love on her heart. His compassion was over whelming for her. His words, his love, his eyes- everything about him was so pure, so true. Her heart was getting intertwined with the love he was bestowing upon her. 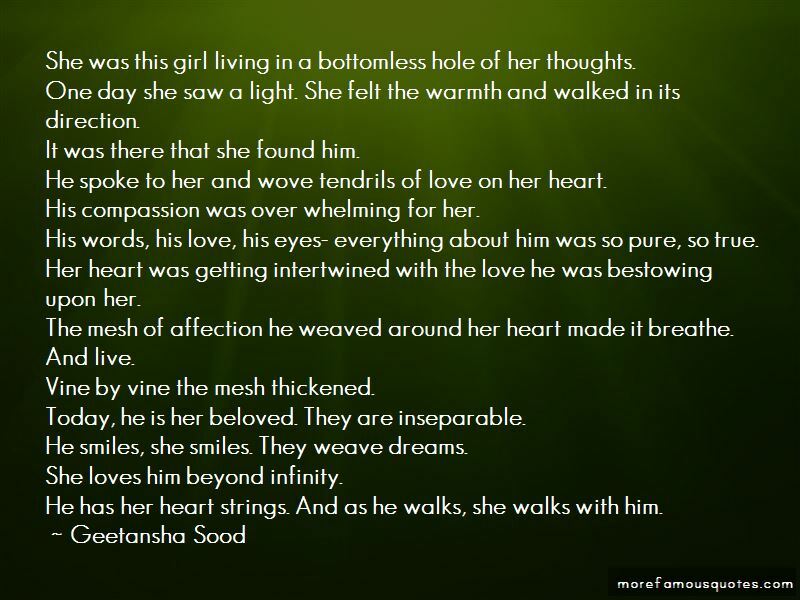 The mesh of affection he weaved around her heart made it breathe. And live. Vine by vine the mesh thickened. Today, he is her beloved. They are inseparable. He smiles, she smiles. They weave dreams. She loves him beyond infinity. Want to see more pictures of Geetansha Sood quotes? Click on image of Geetansha Sood quotes to view full size.